We're the ONLY Authorized Distributor for MINIX in Singapore. Why is it important to buy from us? 1. 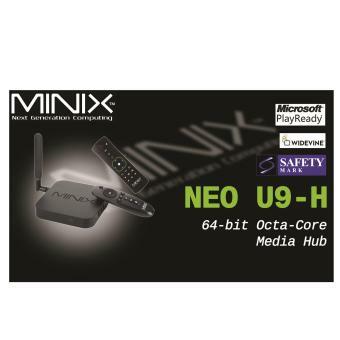 Products bought from non-authorized distributors DO NOT carry MINIX warranty and WILL NOT be recognized by MINIX. 2. Our products are authentic, sealed and brand-new. With up to 60 frames of video per second (fps), NEO U9-H delivers smooth, responsive, crystal-clear picture quality. Connect NEO U9-H to a 4K TV and delight in the seamless visual rush of 4K Ultra HD with crisp, life-like images that practically jump off the screen. NEO U9-H accomplishes new heights of picture performance with full HDR10 support. HDR (High Dynamic Range) technology widens the colour spectrum, displaying brighter whites and deeper blacks, accentuating the contrast to create a more natural, vibrant viewing experience. With more and more HDR10 content being served, this truly is the future of TV. NEO U9-H brings the full-theater sound to your living room. Fully licensed Dolby Audio delivers unsurpassed, vibrant sound quality that brings your entertainment to life. Equipped with a powerful Octa Core processor, NEO U9-H gets you to your favourite shows and movies fast, with smooth and responsive navigation and apps that launch quickly. NEO U9-H’s innovative passive cooling solution prevents overheating no matter how strenuous the task, while operating in absolute silence. Android Marshmallow 6.0.1 OS introduces Adoptable Storage; the ability to adopt external storage media to act like internal storage. Expand the built-in 16GB eMMC internal storage on your NEO U9-H simply by connecting a micro SD card or external HDD. Say goodbye to buffering, stuttering or freezing. Thanks to its 802.11ac 2 x 2 MIMO Dual-Band Wi-Fi and Gigabit Ethernet, NEO U9-H makes streaming what you love easy. Licensed support for both Microsoft Play Ready 3.0 and Google Widevine Level 1. NEO U9-H’s implementation of these two Digital Rights Management schemes offers enhanced content protection essential for certain streaming services. Whenever new features and functions are added, you can download them directly via our F.O.T.A (Firmware-Over-The-Air) update system. So, the NEO U9-H you buy today will be even better tomorrow. Click here to learn how to install Kodi Exodus in 5mins. You can watch shows or play your games anytime, anywhere and with anyone you want. Singapore, Malaysia, Thailand, Hong Kong, Taiwan, Vietnam, Japan, Korea, Australia, New Zealand, USA, Philippines, even cruiseline Royal Caribbean, Princess Cruise and more. All you need to do is plug it in and connect to a working internet connection!